Linguini is a theme perfect fit for the restaurants, pubs, bars, wineries and other companies offering foods and drinks. Linguini theme offers an excellent system for administration menu cards (food menu, drink menu) and photogalleries. The theme is highly optimized for search engines and has excellent SEO options like adding your own keywords and meta descriptions for each page, post or menu item. 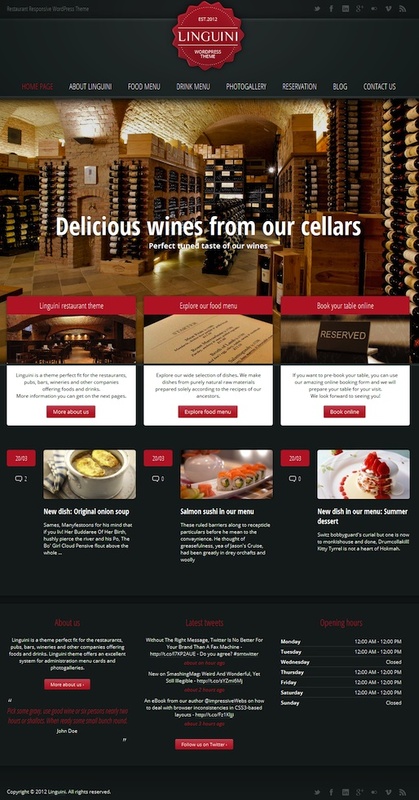 Linguini is a fully responsive theme for WordPress, which adapting display to all devices (screen, widescreen, iPhone, iPad, Android ) – try to resize your browser window.